Mark Margolis's Blog | It's about Software, CRM, Product Development and sometimes Food. Hello all, you can now download FinDemo CRM 2016 update 1 from the solutions page (http://aka.ms/findemo). I will update DemoBuilder in due course but in the meantime you can provision a FinDemo template and apply the files over the top. And you thought buying LinkedIn was big news! The updates includes some bug fixes (like Security missing from the sitemap) and also some cool new features from Paul Mare on Client 360. If you came to this site from the Observer / Guardian article then you can find more on the Yammer Survivor Network here or please contact the Microsoft Disaster Response team: www.microsoft.com/disasterresponse. Their twitter page is here: @msftresponse. At the partner event in March, we showed you a pretty exciting demo about the power of CRM Online as a platform, and how people might interact with business systems in the future. Those of you that attended the demo but where sceptical when I said we would make the code available to you, well here it is! Look for Kevin Hughes blog for the code. Amazing effort by Kevin and look out for much more from Kevin and the UK Team! Enjoy! Thank you to everyone for the great feedback and interest on my last post on Business Value Realisation. I’ll be adding more on this topic in due course. For this week I wanted to share with you a presentation I did just recently for a partner event. Firstly I would like to thank Jukka Nirrranen for giving me permission to use his screenshots from an article he wrote back in 2013. 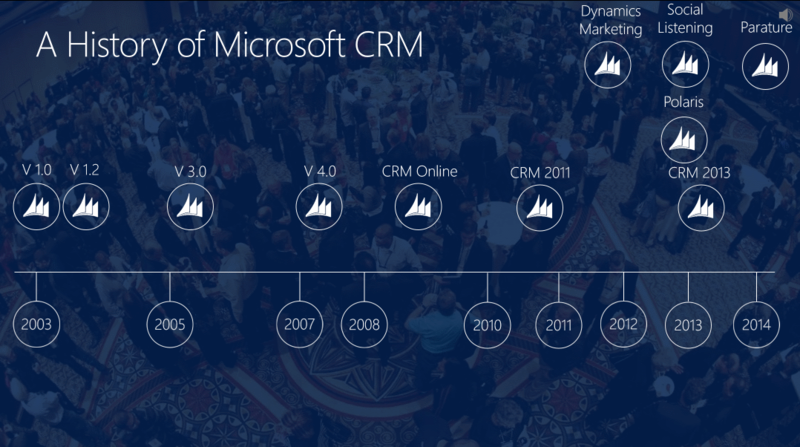 I took his screenshots and turned it into a presentation to highlight the rate of innovation that we are seeing in the Microsoft CRM Platform, particularly in recent years. I certainly had a lot of fun putting it together although I did make me feel really old! Please note that the dates are not official dates from Microsoft but I think they are quite accurate. The PowerPoint presentation is below, you will need to watch this is presentation mode for it to work as there are builds. One of the most satisfying parts of my job is going back to an implementation after the licences have been purchased and the software implemented to review the success of the project. 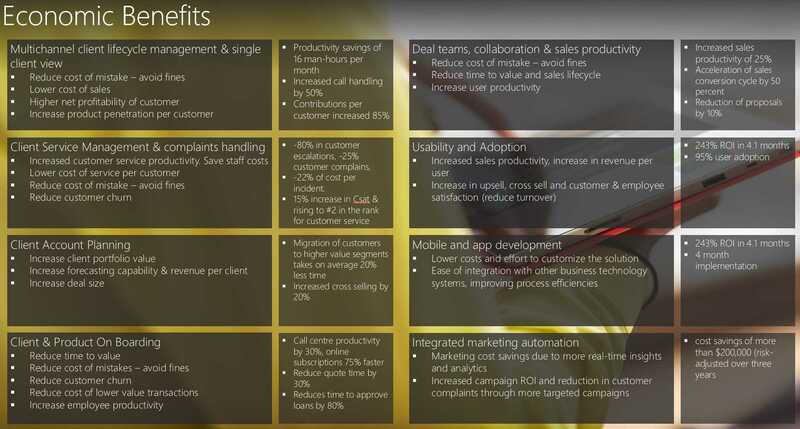 The success of our customers is paramount to everyone at Microsoft and we are all incentivised to make sure that our customers use our services and that they achieve the maximum business benefits. Seeing how our customers implement our business applications in less time and at half the cost (on average based on a study from a 3rd party – more on this later) is something to be proud of but really getting under the hood and seeing the ROI and business metrics really makes you realise how we are able to help our customers transform their businesses. I put the slide above as an example of how we can communicate the value we can bring to our customers based on real case studies from existing implementations. I have grouped Return on investment stats with economic benefits aligned to typical use cases and workloads. This is really a small snapshot and I will add to this in the future. I can’t share the customer names right now but I am seeking permission to do so and hope to get this soon. However some of these stats with customer names are available on my case study post. -22% of cost per incident. Complaints has dropped from more than 600 to just 44 over 18 months. 55% of calls within 20 seconds and their abandon rate is under 2%. In the first 24 days, operators served 117 thousand depositors, plus 30,000 customers who used the self-service feature on the web portal.